So while everyone else in the fashion world is looking forward to/posting about the Spring 2014 collections showing at New York Fashion Week, over here in the real world we're just starting to think about Fall 2013! The 2012 board featured lots of pics from the J. Crew Style Guide, Essie autumn collection, and Longchamp. However, my absolute favorite was the Tommy Hilfiger 2012 ad campaign (blogged about here). I wondered if TH would be able to top themselves this autumn, and obviously I shouldn't have doubted them. This year's campaign is just as wonderful, and I may even like it better because its setting (college!) is relevant to my age group. Are you not dying? 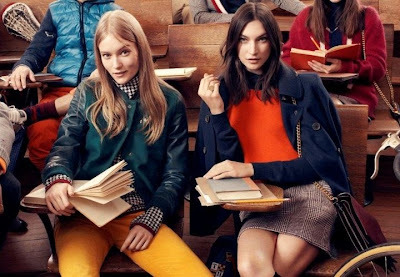 The campaign was centered around "Chloe goes to college" and the classic collegiate feel of the photos makes me wish everyone at my college dressed this fabulously every day! I'm loving the saturated colors (yellow, teal, orange), the great textures (velvet /corduroy), and the incorporation of herringbone. Seriously, can I just be Chloe? Le sigh. For now I'll keep daydreaming I attend this gorgeous autumnal college where everyone looks ridiculously perfect at all times. What's your favorite Fall 2013 campaign? 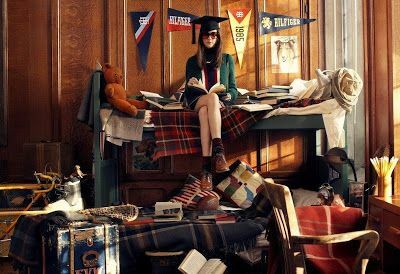 I love this campaign, I wish my university days looked more like this! The mustard coloured jumper in the sixth image is perfect. 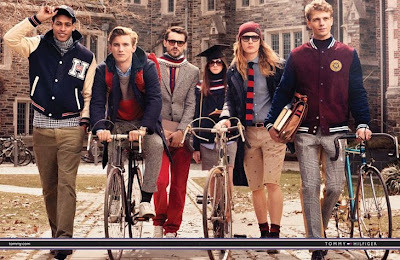 I love Tommy Hilfiger's Fall campaign!